Erica married Jeff on June 25th, 2011 at Scripps Seaside Forum in La Jolla. At first we were worried about the weather for the day, but it ended up being an amazing day for this couples wedding! The Forum is an amazing place to have a wedding. The grassy ceremony area was perfectly set up for the beautiful wedding. Guests enjoyed great food and drinks at the cocktail hour located right outside the reception doors. Everything was so conveniently located so guests would be able to enjoy them selves. 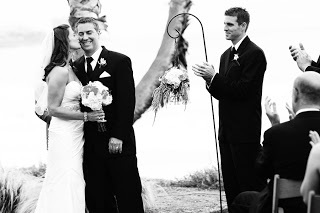 Scripps is the ideal location to have a ceremony and reception because of the great logistics of the venue. When the reception doors opened the room was covered in beautiful flowers provided by Holly Hill Florals. Not too over the top, but perfectly sized for the Forum. With tall ceilings and natural wood walls any floral looks good in there, but the ladies from Holly Hill Florals did an amazing job. One of the best treats of the wedding was that Little Scene Flip Books was there to provide guest favors! They are such a fun alternative to photobooths. Guests walked away with a huge smile on their faces and flip books in hand.